The University of New Brunswick and Kent Building Supplies are helping a small community in France celebrate its Year of Canada. UNB’s Gregg Centre for the Study of War and Society and Kent have sent 500 Canadian flags to Givenchy-en-Gohelle, a small farming village in France. The mayor of Givenchy-en-Gohelle, Pierre Senechal, has declared 2017 the Year of Canada in his community as a thank you to Canada for its role in liberating the village from German occupation during the Battle of Vimy Ridge. 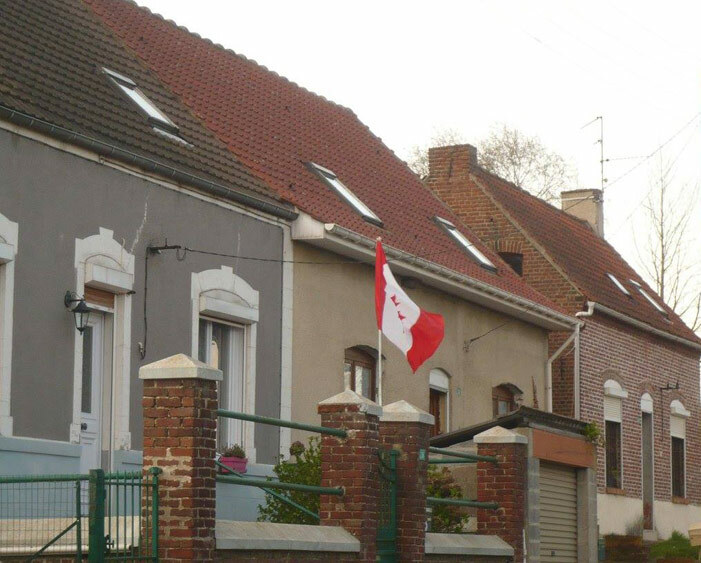 As part of its celebration, every household and business in Givenchy-en-Gohelle will display a Canadian flag on its property. On March 27, residents of Givenchy-en-Gohelle and members of UNB, and the surrounding community, spoke together via videoconference. The mayor of Givenchy thanked UNB and Kent for the flags, and expressed his gratitude to Canada. One hundred years ago, during the spring of 1917, Canadian soldiers were given the order to seize Vimy Ridge, France, and drive out German forces entrenched there almost continuously since the beginning of the First World War. On April 9, the soldiers stormed the ridge and liberated their French allies – 3,598 Canadians were killed and about 7,000 were injured. The town of Givenchy-en-Gohelle was on the front line between German and allied forces and is the site of the Canadian National Vimy Memorial in France. Since 2008, the Gregg Centre has been involved in the delivery of teachers' professional development study tours in France and Flanders. During that time, hundreds of high school teachers from across Canada have visited such sites as Vimy, Ypres, Passchendaele, Dieppe and the landing beaches in Normandy, to learn about the latest research on the wars by professional historians, and to gain insight on the latest pedagogical thinking at the elementary, middle and high school levels. Givenchy-en-Gohelle was one of the communities that the teachers group visited last July.